A typical French market in Menton. You would never see this in Monaco, partly because it's not part of France, but also its residents probably have their food imported and directly delivered to their homes. Our last full day in Nice began with taking the #100 bus* to the end of the line, which Rick Steves, travel expert for the liberal and vehemently non-mainstream American tourist, led us to believe was a small town bordering on village. I believe the exact words used in his guide to Provence and the French Riviera were "a poor man's Nice," but to me it seemed pretty much the same as the rest of the Côte d'Azur except closer to Italy. (I know this because of all the road signs pointing to Italie). Sure, some of the buildings in Menton were a bit more rundown than in Cannes, but it still had a decent beach and boardwalk - and the sidewalks were even adorned with citrus trees bearing fruit in the middle of winter! (Basically, anything bordering the Mediterranean feels like paradise when you're accustomed to dreary gray skies and the perpetually murky Seine). But once it became clear that Menton couldn't conceivably be covered in 20 minutes, as we originally thought it would, we hopped back on the bus toward Monaco. Everything I "knew" and anticipated about the principality came from movies; most notably To Catch a Thief and Casino Royale. So did it live up to my lofty expectations? Yeah, pretty much. 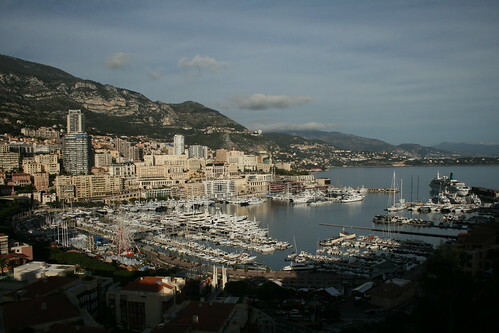 Monaco is essentially a cluster of high-rises centered around two nearly adjacent harbors that are separated by the Prince's palace that perches between them atop a cliff. Streets are filled with banks and haute couture (pretty sure I just misused this term; but this is not a fashion blog so whatever) designer boutiques, but what else would you expect from a principality that has no income tax and whose economy was saved in the late 19th century by the opening of the infamous Monte Carlo casino? Like most tourists we took photos out in front, whilst trying not to get run over by the endless stream of luxury vehicles and vintage cars vying for a prime parking spot. After heeding the sign just inside the main doors - no shorts for summertime visitors and absolutely no cameras, ever, which is too bad because the interior is stunning - we entered the casino. Normally each room has a different entry fee as per a tiered system that includes free-to-play slot machines near the lobby and progressing upward to private game rooms costing 20€ at the door. Luckily on the day we went these rules weren't enforced. Roulette looked too complicated so Kiyoshi and I opted for blackjack. We felt a little lame buying in at just over the minimum 10€, when moments earlier an older fellow at our table dropped 3 crisp 500€ notes for more chips. (Side note: before that I was unaware that 500€ notes existed). A Spanish girl left the game just before we sat down after losing her money in the first round. 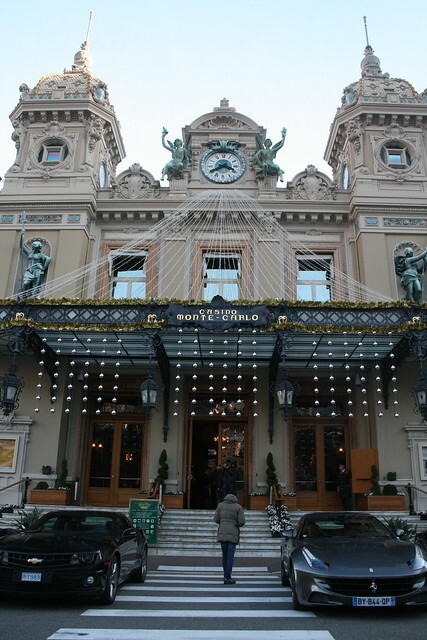 "Oh well, at least now I've played blackjack at Monte Carlo," she said to her friends. I smiled, not only because I remember enough Spanish to have understood her, but also because that was my exact mentality. I may not be as high-rolling as the owner of the Ferrari parked outside, but at least my brother and I didn't lose any money. It's really a shame that photography is forbidden within the casino; I think something along these lines would have made a most excellent addition to our family holiday card. *Public buses are a mere 1€ per one-way trip, so don't bother with the train unless you're absolutely pressed for time. 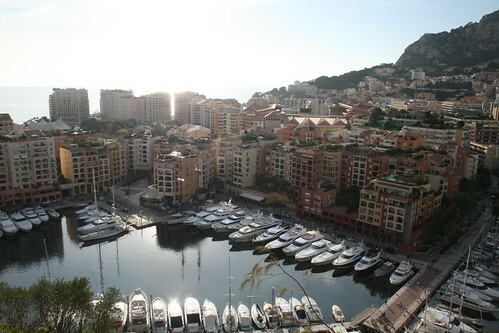 See more of Monaco here.